The GearWrench External Snap Ring Pliers can remove and install internal snap rings from 1/4'' to 1 7/16'' in diameter, includes 5 pairs of interchangeable points, requires 5/64'' hex key when replacing points, and when needed use replacement point sets 447 and 448DD. The 446D GearWrench External Snap Ring Pliers is one of thousands of quality tooling products available from MRO Tools. 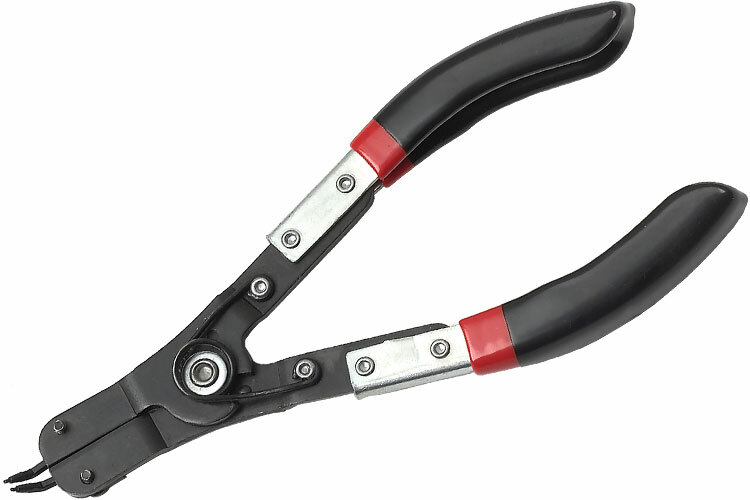 Please browse GearWrench Snap Ring Pliers for tools similar to the 446D GearWrench External Snap Ring Pliers. 446D GearWrench External Snap Ring Pliers description summary: GearWrench external snap ring pliers. Tips Included: 0.039'' Diameter 15° Angle, 0.048'' Diameter 15° Angle, 0.074'' Diameter 15° Angle, 0.039'' Diameter 45° Angle, 0.047'' Diameter 90° Angle Quantity discounts may be available for the 446D GearWrench External Snap Ring Pliers. Please contact MRO Tools for details.